Thyme (Thymus spp.) and rosemary (Rosmarinus spp.) both traditionally belong in the herb garden, but with an understanding of their different growth habits, you can use these herbs effectively as ornamentals. Thyme grows in U.S. Department of Agriculture plant hardiness zones 4 through 9, while rosemary grows in USDA zones 7 through 10. Hardiness does vary depending on species or cultivar for both types. A close-up of rosemary leaves. Thyme has small, rounded green leaves that feel soft between the fingers while rosemary has stiff needlelike leaves. Rosemary grows on straight stalks that change from green to woody as the stalk matures. Tender young thyme stalks are thin especially early in the growing season. 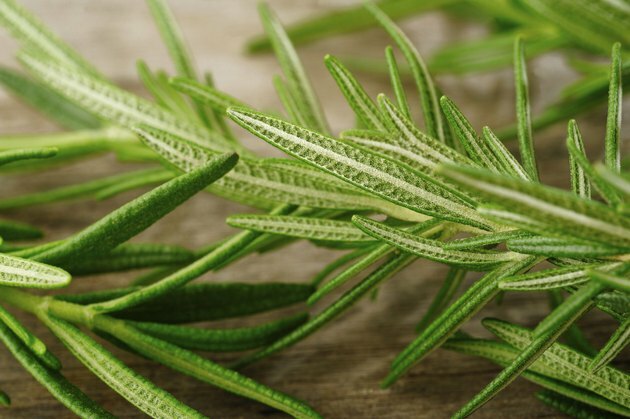 Like rosemary, thyme stalks mature to a brittle, woody consistency. Rosemary shrubs can get up to 6 feet tall and 4 feet wide, while thyme grows 3 to 12 inches tall and 12 inches wide. Rosemary, native to the Mediterranean, and thyme, originally from southern Europe, are both well adapted to hot, dry summers and mild, damp winters. Thyme can tolerate freezing weather -- down to minus 20 degrees Fahrenheit -- compared to rosemary, which can't tolerate temperatures much below 15 F. When it comes to water, both thyme and rosemary prefer dry soil to wet and grow best in full sun. Both these aromatic herbs make a good fit for a water-wise garden. Thyme makes an excellent edible, fragrant and green ground cover. For an especially low-growing variety, try creeping thyme (Thymus serpyllum) which grows in USDA zones 4 through 9. It grows 3 inches tall and is a smart choice for between paving stones, as a ground cover or growing over a wall. Rosemary, with its woody upright growth is best suited as hedge. Use it to edge a pathway -- as people brush past, they can smell the aromatic leaves. In the herb garden, orient rosemary in the background and keep thyme up front. Or, choose a trailing rosemary, such as "Irene" to spill over a wall or container. These two perennial woody herbs provide year-round harvest in mild climates. Pinch off the branch tips as you need them. Pinching is also stimulates growth and encourages a bushy shape. While you can find a variety of ornamental thyme species, look for English thyme (Thymus vulgaris), which grows in USDA zones 5 through 9, for the culinary herb garden. Rosemary cultivars bred for their taste include "Salem," "Well-Sweep Golden" and "Spice Island." These also grow in USDA zones 8 through 10. Is Lavender a Type of Sage Plant?